TL; DR: When it comes to managing data within an organization, precision is key. While the sum of all data is important to the overall health of an organization, not everyone needs access to all of it (and, in some cases, they shouldn’t). That’s where packet brokers can make a big difference — by delivering data only where it’s essential. NETSCOUT has developed a software-based approach to packet brokering that makes managing data across networks and applications easier and more efficient. Through a combination of continuous learning and listening to customers, the team at NETSCOUT is breaking down barriers and disrupting the application and network performance management market as we know it. It takes many types of IT specialists to manage the data of a business so operations can run smoothly. In an enterprise, different teams need particular views of the same data to perform their jobs. NETSCOUT, a company that provides packet broker software, among other IT business solutions, is a driving force behind delivering the right data to the right people without wires getting crossed. The problem boils down to teams having similar data needs but fundamentally different infrastructures, according to Ann Sun, Senior Director of Product/Solutions Marketing. “That may cause lack of shared perspective and what we call silos of visibility,” she said. NETSCOUT’s packet flow solutions allow IT teams to get the data views they require while also providing a common overall view of the information. For example, NetOps teams need data views that allow them to troubleshoot network issues, while security operations need to be able to view network traffic to determine risks. “Our philosophy is that we need to be able to get all of the packets that are needed to any of the teams that need them,” Ann said. NETSCOUT’s software-driven architecture, which allows IT teams to access packet flows without creating disruptions, sets the company’s packet broker solutions apart. While most packet brokers are proprietary hardware, NETSCOUT’s packet broker software is more cost-effective and customizable. “We’ve transitioned from a hardware- and appliance-oriented organization to putting these capabilities into software features, which gives a lot more flexibility to meet those different modern network architecture needs,” Ann said. NETSCOUT revamped packet brokering into cost-effective software, according to Senior Director of Product/Solutions Marketing Ann Sun. 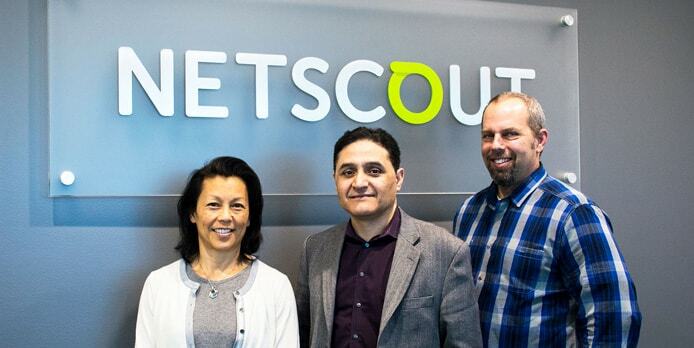 A company of around 3,000 employees with a presence in both service provider and enterprise markets, NETSCOUT provides IT management solutions to organizations in more than 50 countries around the world. Having worked with many different types of customers, NETSCOUT is highly familiar with the critical challenges of modern IT teams. Ann met with us to describe some of the challenges of packet brokers, along with how NETSCOUT is disrupting the packet broker market with innovative approaches. In the history of packet brokers, there is a long line of solutions in the form of proprietary hardware. These traditional turnkey appliances, Ann said, place limitations on IT operations. Additionally, according to Ann, this type of product can get expensive. In the past year, NETSCOUT introduced a software-based architecture for its packet broker. The venture does everything that hardware can do but allows customers more flexibility with how they implement it. NETSCOUT’s innovative approach was partly made possible by the Open Compute Project, an initiative that allows vendors to leverage standard hardware network switches and the innovations built into them. Companies like NETSCOUT can put software on top of the hardware, making it more cost-effective for customers. For companies that need to scale globally, NETSCOUT provides a solution in the form of its PFS (Packet Flow Switch) mesh technology. It has what Ann calls an “automagic” ability to connect all packet flow switches together with the software in a dynamic way. The NETSCOUT Packet Flow Systems team engineered a software-driven way to automatically connect switches. For example, if an organization requires an additional packet broker for more bandwidth or new systems, putting a new packet flow switch into the PFS mesh automatically connects it with the others. The software also has the intelligence to have other packet flow switches pick up the slack when one is taken offline. Automating these processes saves IT operations teams time and makes the software cost-effective for even the largest web-scale organization, she said. Scalability has been a major focus for the company, according to Ann, who said the company’s software-based packet broker has many features that can be configured to make IT operations more efficient. Whether all teams need to see the same data or completely different information, NETSCOUT’s packet broker has the capacity to filter and customize the data each team sees. For example, security teams might want to see traffic from specific locations or all traffic, and the network team might send them everything. The security team can decide to filter for specific security systems or the type of traffic. “There are a lot of different functions that a packet switch can do. It’s all configurable, so you can customize that for any of the individual systems that you’re sending those packets to in whatever way you need to do that,” Ann said. Another function the packet broker performs is stripping tags put onto packets when traversing the network. The packet broker also has the capability to load balance packets and the traffic that flows into each of those individual systems. With multiple systems, this can help with redundancy and high availability. The packet broker can de-duplicate traffic coming in from all across the network to reduce the complexity for each individual IT system. Getting data to the people who need it is one thing. The additional challenge is the data, such as healthcare or credit card information, that needs to remain private. NETSCOUT’s packet broker has the ability to strip certain data when it’s delivered so personally identifiabl information is not shared. 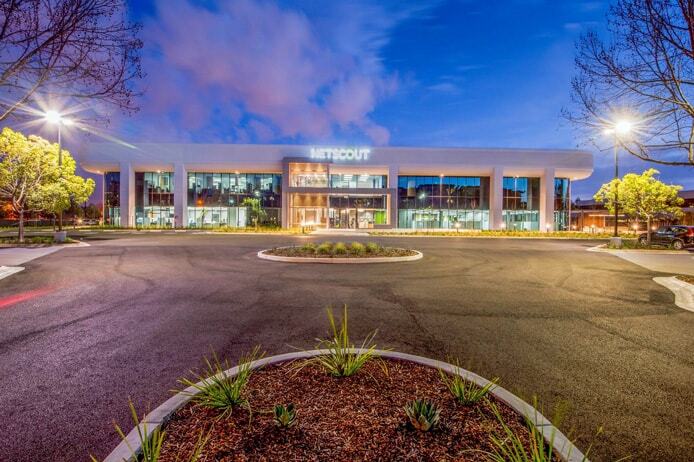 In addition to offices in San Jose, California, NETSCOUT maintains locations in five continents. The packet broker can strip or slice the packets and, essentially, not send some of the data to specific systems or users depending on what level of access they’re allowed to have or what the systems need to see. This applies to the filtering of specific data on a practical level – for example, a web application firewall doesn’t need to have all traffic sent to it (just web traffic), while other security systems might need to see all traffic. When it comes to making a better product, NETSCOUT takes a holistic approach by considering both the knowledge and expertise of their team and the experience and feedback of their customers. “It’s really important that we understand the challenges our customers face so that we can develop to support them with the capabilities that they need,” Ann said. At the same time, on the engineering side, there’s plenty of originality and momentum within the company to continuously improve their packet broker solutions. “It’s a balance for us in taking advantage of technology advances and innovating, as well as continuing to focus on solving customer IT challenges as those challenges continue to evolve,” Ann said. In May, NETSCOUT will hold a customer event called Engage to collect yet more feedback and share information with customers. These customer interactions, Ann said, are valuable to their company and help them stay on top of the packet broker market by striving to create the best product available.